Brian Barge (Individual Consultant) – with support of The Evidence Network Inc. This report, commissioned by the Asian Development Bank, provides a description of young companies and their founding entrepreneurs in Ho Chi Minh City, Da Nang, and Phnom Penh, and an assessment of the venture support programs designed to support their growth. The assessment was conducted between March and October 2016 and is based on information gathered from 515 companies. Based on our analysis, and experience in the evaluation of business support programs, we provide recommendations to improve program effectiveness, and possible next steps. Sixteen programs in Vietnam and Cambodia participated in this pilot assessment project. The programs range from large government-funded programs, to more modest donor-funded and university affiliated programs. Nearly all of the programs were recently founded. Our assessment of the impact of the venture support programs is based on data from 206 client companies. Read Appendix 1: Entrepreneur and Venture Support Programs in Ho Chi Minh City, Da Nang, Phnom Penh (All Locations). Read Appendix 2: Entrepreneur and Venture Support Programs in Da Nang. 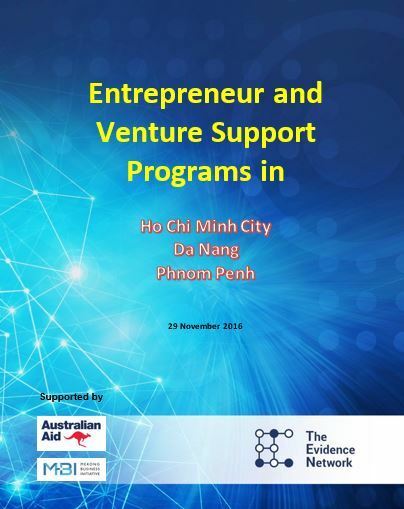 Read Appendix 3: Entrepreneur and Venture Support Programs in Ho Chi Minh City. Read Appendix 4: Entrepreneur and Venture Support Programs in Phnom Penh.